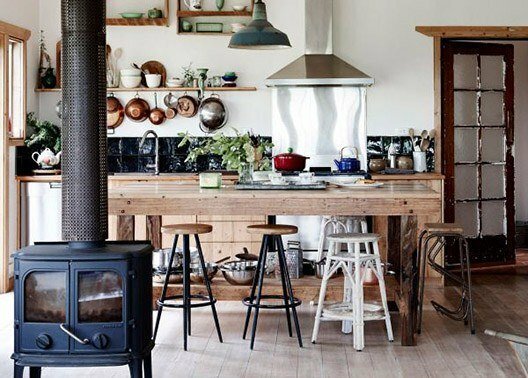 It’s fair to say that our dream kitchens will involve lots of space and light but no doubt at some point in our life we will have to make do with a kitchen space that is a little more on the snug side. Making the most of a limited space involves prioritising, using space wisely and designing to avoid both physical and visual clutter. The first thing you need to do is to decide on the layout as you need to work with the space in your kitchen, not fight against it. In some cases, you might be able to make structural changes – such as removing a wall – to give yourself more kitchen space but it’s always best to try and work within the existing load bearing walls and the piping. Moving load-bearing structural elements or committing to ambitious plumbing changes is opening up a pandoras box of time, cost and planning grief. An alternative is to open up a gap between load bearing beams in an existing wall which is often as good as removing a wall altogether in terms of the openness it provides. This kind of change can easily transform a dark, pokey little kitchen into a part of a spacious kitchen and living room area, and can add tremendously to the value of your home. But if this is not an option – or your budget won’t allow for it – there are still a number of things you can do to make great use of a small kitchen – you just need to be a bit clever with your design choices. Certain kitchen layouts are far better suited to small spaces than others are. Single wall kitchens – A single wall kitchen aligns all of your appliances, storage and workspace along a single wall, and uses very little in terms of space outside of the immediate area. A single wall kitchen’s a very efficient use of space, but isn’t ideal for serious cooking. L-shaped kitchens – If your kitchen area is tucked away in the corner of a larger room, an L-shape gives you more options, or possibly even a U-shape to add in a breakfast bar that could do away with the need for a dining area and they allow you to establish a proper kitchen work triangle between the refrigerator, stove and sink. Galley kitchens – If your kitchen is very narrow, a galley-style layout with everything side-by-side works best. These types of kitchens are typically narrow, and offer fantastic efficiency in terms of the storage and workspace they provide. 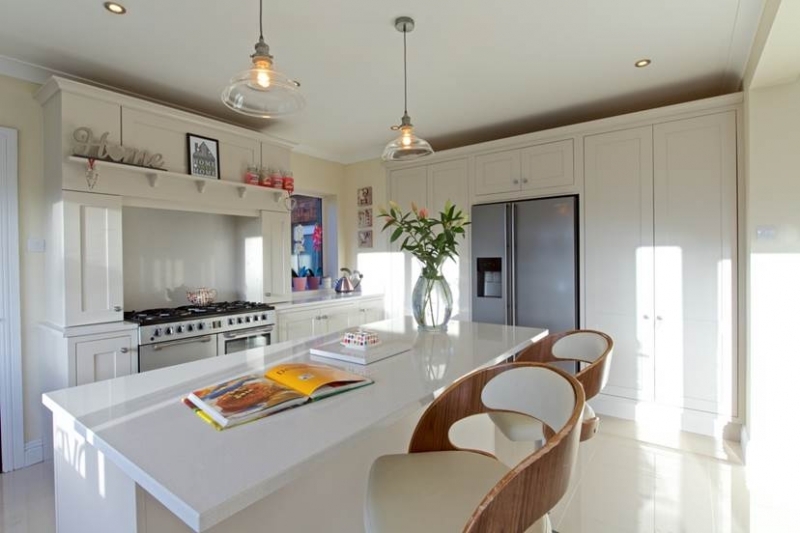 Island kitchens – Single wall kitchens that use an island to create a galley-type setup are well suited to open-plan apartments, because they allow a second work surface (and potentially a breakfast bar) without completely enclosing the kitchen area. Remember with L shaped kitchens, it’s easy to overlook something as simple as an open cupboard preventing access to the fridge or dishwasher. Think about how certain areas can be used for different functions, and see what areas can double up. Make the Most of Your Light! One problem that is often found in small, tucked-away kitchens is a lack of natural light, which can make the space feel pokey and dingy. To make it seem brighter – and bigger – clear away clutter from your window and then use hard, glossy surfaces to bounce the light around the room. Textured wallpaper and carpets absorb the light, so stick to shiny tiling and glossy kitchen cabinets. Another favourite improvement (and a relatively cheap one at that) is to bring more light into the room – either through a skylight, or simply by painting the walls in a nice light colour. Adding mirrored surfaces in the right places can also help to create the illusion of space and project light further into the room. For instance, a typical oven normally takes up well more than 1m2 of space. If you’re not an aspiring master chef, it could be practical to do without a full sized oven in favour of a smaller bench-top oven or convection microwave. Likewise with dishwashers – if you rarely cook anything substantial or don’t regularly host dinner parties, you might find a half-sized dishwasher (or no dishwasher at all) is a better use of your space than the full sized version. Or if you’re looking to save on space where the fridge is concerned, opt for a slimmer fridge rather than full size. Single bowl (or 1.5 bowl) sinks are obviously best in smaller kitchens, but be sure to consider how drain boards impose on valuable bench workspaces. Some sinks allow you to attach chopping or drain boards over sinks, which can also help to create more space when it’s needed. In summary, shop around and look for more compact models to see if they can fulfil your needs. Even if you already have a cooker, if you’re spending money on refitting an entire kitchen, a bit extra to replace your existing model with something more compact may be worth the expense in order to make more space. Clutter is the enemy in small kitchens – worktops with loads of bits and pieces on them really make the space feel crowded and claustrophobic, so you need plenty of storage space. Only essential, regularly-used items should be out on your work surfaces – the rest of it needs to find a home. If you’re lucky enough to have a high ceiling, make the most of that space by using high kitchen cabinets that extend to the roof. Also, add extra shelves wherever possible; if your washing machine is smaller than your worktop height, fit a shelf in just above it – the same goes for the cooker, fridge etc. If you’re adding a breakfast bar, could shallow drawers sit comfortably underneath the counter top? Solutions like this provide a great deal of storage space without affecting the space in the room.